Union demands and labor disputes might still push The Hobbit to film in a country other than New Zealand, where The Lord of the Rings was shot. Tolkien nerds everywhere cheered when we heard the news that The Hobbit was finally greenlit by Warner Bros. and that Peter Jackson's production could finally move forward. But that doesn't mean the film isn't still beleaguered by disputes from labor unions. Even though WB has invested over $100 million in the production, continued disputes might encourage it to decide to move The Hobbit to Eastern Europe. Last night, a march of over 1500 technicians was held in Wellington to show their support for keeping the production in New Zealand. The Council of Trade Unions president Helen Kelly hinted that Peter Jackson was behind the march, and that he was acting like a "spoilt brat." Jackson and Prime Minister John Key will meet with WB executives next week to alleviate their concerns. In a statement released by Warner Bros. on Friday morning (New Zealand time), the studio confirmed that it was indeed considering the option of moving the production to another country. Warner Bros. confirmed that the actions of the actors unions in New Zealand prompted the response, which is a shame because of the thousands of people in New Zealand who will be unemployed if the production moved, including the 1500 who marched in Wellington in support of the film. "I watched the march on TV. I wasn't there and unlike what Helen Kelly's been saying I didn't have anything to do with organizing it," Peter Jackson said. "Suddenly I see Helen Kelly and she starts slagging off the production. "Here's Helen Kelly, who represents the workers of New Zealand, and she's trivializing the feelings of these 1000 very concerned people and supporting an Australian union. I thought 'God, what planet are we living on?'" Helen Kelly believes that the production was always intended to go overseas to reduce costs and that the union is being set up to take the fall. The Hobbit currently gets a 15 percent tax break but there have been reports that other countries are offering up to 30 percent. "New Zealand performers want the movie made here as much as anyone, but let's get all the facts on the table about taxes, subsidies, and other issues - rather than just blaming the union for asking to meet on basic terms and conditions," Kelly said. Oddly enough, the Prime Minister of New Zealand is getting involved and is hopeful that the production will go forward. "I don't think we should write off our chances of retaining the movies," PM John Key said. "My concern is that if Warner Brothers deems New Zealand is not a good place to make movies, then there is a real risk other major film production companies will also believe that to be the case." That's why he will be at the WB meetings with Jackson. "There's work to be done and the Government hasn't given up trying to do its best to secure the movies," he said. It would do harm to the The Hobbit if the production moves to another country. 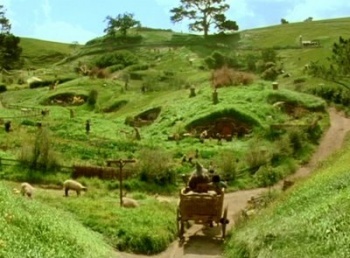 The landscapes and vistas provided by the amazingly photogenic countryside of New Zealand was such a big part of the Lord of the Rings films. Of course, The Hobbit will still be good because Jackson is at the helm, but it would be a shame if it was filmed in, say, Nebraska.